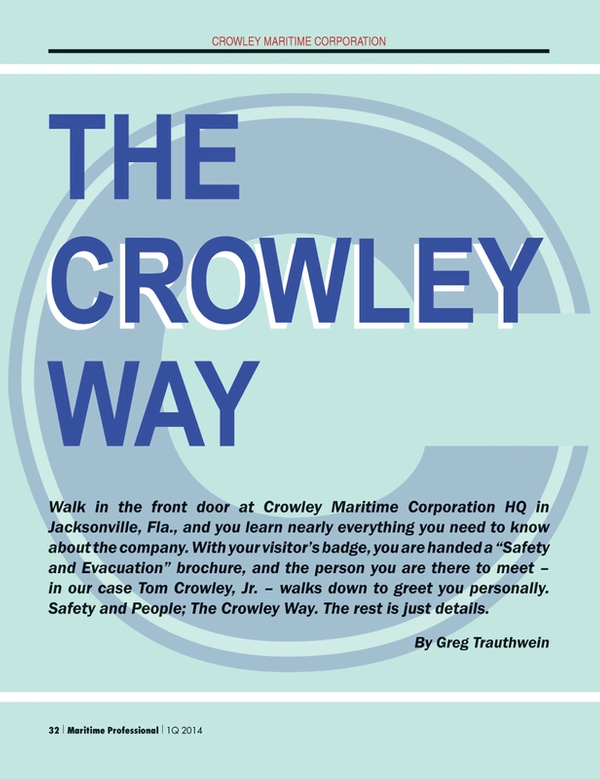 Walk in the front door at Crowley Maritime Corporation HQ in Jacksonville, Fla., and you learn nearly everything you need to know about the company. With your visitor’s badge, you are handed a “Safety and Evacuation” brochure, and the person you are there to meet – in our case Tom Crowley, Jr. – walks down to greet you personally. Safety and People; The Crowley Way. The rest is just details. Crowley Maritime was founded in 1892 by Thomas Crowley in San Francisco. Its fleet: A single Whitehall rowboat purchased for $80, used to ferry people and supplies from shore to ships anchored in the Bay. From these humble beginnings has grown one of the strongest and recognizable maritime franchises in U.S. history. A diverse, privately held $2B plus per year U.S.-based transport and logistics organization with a fleet of more than 200 U.S.-flagged vessels, a company which is still held privately by the Crowley family, run today and for the past 20 years by Thomas B. Crowley, Jr., Chairman and CEO. From an early age Tom Crowley, Jr. knew that the family business that bore his name would indeed be his destiny, too. “I don’t know when it was exactly that I knew I wanted to work here, but with our last name attached to it, I felt that I would have something to do with the business,” said Crowley. During his high school and college years, Crowley would work at the company in a variety of jobs. A self-described “operations guy,” he saw the diversity of the business and the operations, and saw ample opportunity for himself. Soon after joining the company upon graduating college, though, fate entered the picture, as Tom’s father became ill, and the line of succession – which he had envisioned would take 10 to 15 years – was compressed to three years when his father passed away and Tom took the helm of the $1B per year company. “I didn’t have a lot of time to plan and think ahead of what was going to happen,” Crowley said. “And there were many days when I sat there and thought ‘is this even possible.’ But I knew that if I didn’t at least give it a try that 20 years later I would feel bad. And keep his head about him he did. At the time of Crowley, Jr. taking the helm, the company was a $1B per year company with about 5,000 employees. Today the company is just about 5,300 employees, but it has doubled to more than $2B per year. Today’s Crowley Maritime is significantly changed from the time Tom Jr. took the reins, change that started with its internal structure based on Tom’s bias towards operations. Prior to him taking over, management was a traditional pyramid, with the CEO on top and all units reporting upward. Essentially Crowley turned that structure upside down and flattened the organization, streamlining the support services and building distinct business units and teams. While the path to the top spot was not planned or easy, early on Tom figured his role as CEO was less about ‘managing by numbers’ and more about establishing and maintaining a consistent culture across all business lines, all locations. The goal: to extend its philosophies on people and safety across every Crowley office and employee so that no matter who or where you are, you get a similar experience in your interaction with Crowley. While ‘knowing your customers’ and ‘creating solutions’ may seem cliché, properly deployed it can lead to significant business opportunity. Take for example Crowley’s recent energy sector venture: the transport of crude oil coming from the shale oil (and gas) revolution in the U.S.
Crowley has been a steady customer for several U.S. shipyards, making significant investments in new tonnage for the Jones Act trade, including the construction of its state-of-the-art tug fleet, ATBs and double hull equipment as well as a recent historic order for a series of new ConRos with VT Halter (see related story, page 38). But it is the shale oil and gas development that has come as perhaps the biggest surprise, and is a direct result of Crowley’s close relationship to its oil major customers to know their needs in regards to transport. The rapid development of the shale oil and gas business in the U.S. is a great example of a private company such as Crowley acting almost immediately to fill a void in the market, creating an interesting business opportunity while fulfilling a client need. “We embarked on a newbuild program with our ATBs to replace the single hull tonnage that was being phased out, and we felt that we were an early mover into the ATB space, building out a fleet of 17 vessels,” Crowley said. “So we were pretty in tune with what our customer base needed in terms of transportation, across the oil majors. None of them saw this coming. We didn’t see this coming. When it happened we were in a fortunate situation where we were able to conclude a deal very quickly,” to acquire a pair of tankers, Florida and Pennsylvania, built by Aker Philadelphia. In a matter of weeks Crowley had commandeered a deal for the tanker to enter a business – the transport of U.S. crude – that previously was completely off of the company’s radar. With the two tankers under the Crowley colors, it expanded quickly and committed to four more tankers, and Crowley said that there could be even more orders in the future. “Clearly it was not anticipated that our equipment would be moving crude,” Crowley said. “We felt that the domestic fleet would be moving product from refinery to refinery. The other big trade for us was supplying Florida from the Gulf, but with gasoline and diesel, we never expected crude to be moving. We are moving crude from Corpus Christi to the Louisiana Offshore Oil Port (LOOP). Our tanker is so small, as I understand it, we only fill up the pipeline from the header to the shore. We don’t even get enough crude in the pipeline to get it to land, but that’s the most efficient way to move it” because there is no infrastructure yet in place. Crowley often repeats the mantra of “the right people with the right tools” in describing his company, particularly in regards to safety and efficiency. From his experience, staying diligent is a cornerstone to grooming an effective safety culture. While the marine market is notoriously cyclical, a company’s commitment to safety cannot. The premise was a program – executed in three simulator centers including PMI, MITAGS and STAR Center – was to provide a uniform assessment program for captains. “There was no program that assesses our captains, so we created this environment within the simulator which is very controlled: 45 minutes at the bridge of a boat and it is a pressure cooker, presenting the captain with 22 decision points,” Crowley said. It took 22 months to run all 630 captains through the program, and there was a simple ‘pass / fail’ determination at the end. After the first run through, there was a 72% successful completion rate. Those needing additional training were provided classes targeting their skill gaps, and were then reassessed. Less than 1% of existing Deck Officers were unable to successfully complete the process and were offered non-navigating positions. Approximately 17% of Deck Officers applying for a position were unable to successfully complete the assessment and were not offered employment. It could be argued that the maritime industry is in a watershed period, with an aging and rapidly changing employee base, a radical shift in the level and amount of new technologies on board vessels of all shape and size, onerous new regulation on emissions from ships and boats and a foundation change of the business itself, powered by vast new amounts of oil and gas coming from domestic sources. Amidst all of that change, the Crowley name today remains a cornerstone.